An experienced practitioner of all forms of dispute resolution, Justin advises on a broad spectrum of civil, matrimonial and corporate matters. In particular, he has acted for and advised clients in matters relating to contentious probate and administration, equity and trusts, director’s duties, restraint of trade, construction claims, intellectual property and shareholders disputes. A graduate of the University of Nottingham, Justin was called to the Singapore Bar in May 2003. 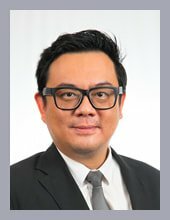 He previously practiced with Drew & Napier LLC before joining Tito Isaac & Co LLP. An advocate and solicitor committed to presenting your case at its highest, Justin strives to establish long standing and mutually rewarding relationships with his clients. The nature of the cases that Justin handles have often required the taking of instruction and liaison with jurisdictions and solicitors outside of Singapore including New Zealand, Hong Kong, Vietnam, Thailand, and Malaysia. Justin acted for the Estate of a successful businesswoman who added her live-in boyfriend as a joint account holder of her largest liquid asset. Her boyfriend had not contributed any monies to the joint account but alleged that he was entitled to its entirety when she passed away on the operation of survivorship. After her passing, her Estate sought a declaration that the joint account monies belonged to her solely under a Resulting Trust. Sought a declaration that a semi-detached property purchased by the husband was intended to be jointly held with his wife. After his demise, the developers had refused to accept the status of joint tenancy. Acted for an Australian International, a “Socceroo”. His wife had transferred substantial sums of money from their joint account out of jurisdiction. He contended that those monies solely belonged to him on the basis of a resulting trust. Justin acted for a businesswoman who had lent significant amounts of money to a fraudster on four occasions. On two of those occasions, a third party guaranteed the sums owing from the fraudster. The businesswoman sued on the guarantees. At first instance, the Honourable Court found the two Guarantees void as they were premised on money lending agreements. The Apex court reversed that decision, on grounds that, amongst other things, Section 3 of the Money Lenders Act did not apply to the loan agreements. Justin acted for a Defendant who was the chief sales officer for the asia-pacific region. The Plaintiff was a large and renowned assurance house. The Plaintiff claimed that the Defendant breached his obligations under the employment contract and/or his fiduciary obligations by collaborating with his future employers. Represented Singapore’s leading company in the business of water leakage detection services and rectification in an action versus an ex-employee on the grounds of breach of confidential information, breach of fiduciary duty, breach of restraint of trade. In particular, he has acted for and advised clients in matters relating to corporate enforcement of rights in respect of director’s duties, duty of partners and enforcement of rights in relation to improper transfers of shares in a corporate entity. Successfully procured interim and final judgments for creditors of a Company. The Plaintiff’s lent large sums of money to a Company who represented that a public listing was imminent. The Defendant Company was in the process of winding up and its director was on the verge of bankruptcy. Justin acted for the Plaintiff. This case was the latest installment in a series of disputes centered on the alleged defective construction of four semi-detached houses. The case involved discussions on a myriad of legal issues including what constituted a contract, delays in the completion of the property, the effect of a settlement agreement, defects in the property, warranties and the payment of liquidated damages. Justin acted for the Defendant developer in a dispute over the construction of 22 units of apartments by the Plaintiff (the main contractor). The Plaintiff claimed for undervalued works and wrongful termination. In the Defendant’s counterclaim, the Defendant contended that the Plaintiff failed to provide an acceptable master construction programme and that the Plaintiff had delayed the project for more than nine months. Additionally, the Defendant claimed for rectification of the Plaintiff’s severely defective works. In a landmark decision; Justin achieved an adoption order for a Grandmother who wished to adopt her own Grandsons. A contest made by a grieving husband upon his late wife’s last Will and testament. The said Will had mysteriously left him nothing despite his loyalty and publicly-known profound affection for her. An experienced Supervising Solicitor, Justin understands the need to balance the applicant’s interest and the rights of the respondent party. He strives to achieve a calm environment where cooler heads can prevail. Justin served as Head Intelligence Officer for the 56th Singapore Armour Brigade before stepping down in 2017 with the rank of Major (NS).